CONSTRUCTION of the new English Riviera Geopark Trail began at the end of 2013. The project will create a 8km cycling trail around Cockington at a cost of £600,000 funded by the Coastal Communities Fund . New cycle-friendly paths are being created using crushed stone utilising existing bridleways connected together with the creation of some new links. The result will be a circular route which runs from Occombe Farm down to Cockington and then up to the top of Shiphay at Gallows Gate before returning to Occombe along the route of the old ring road. 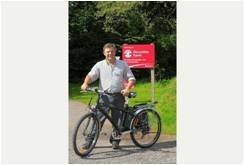 As well as the creation of the paths, the project is funding the construction of a new cycling hub in Cockington from where visitors will be able to hire bikes to use on the trail. The new trail will also connect to the seafront cycle paths that Torbay Council has created helping to fulfil the vision of connecting the Geopark Gateway sites: Occombe Farm, Cockington Court, Torre Abbey, the Geoplay Park on Paignton Green and the Seashore Centre at Goodrington Sands.